Miss Grant Navy Tunic by Miss Grant & Microbe at Blood of The Young. MPN: SKU-A4D5D73F. Hurry! Limited time offer. Offer valid only while supplies last. 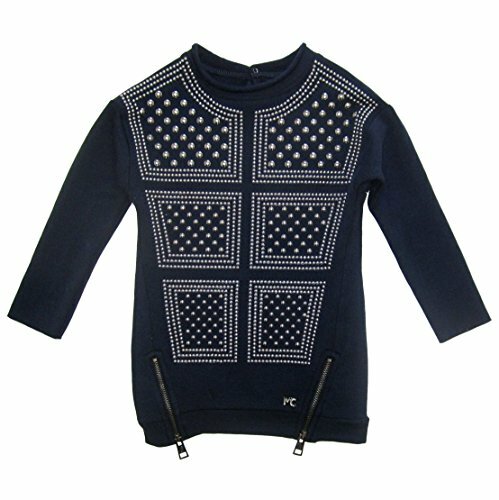 Miss Grant girls long tunic in soft navy fleece. Studded detail on front. Tunic has high neckline and long off shoulder sleeves with raw edges. Zippers and metallic Miss Grant logo attached to bottom. Soft fleecy inner side. Solid navy backside and sleeves. Material is 95% cotton and 5% elastane blend. Made in Turkey.